﻿ Saving Space in Your Warehouse: Can you Avoid a New Facility? what can you do when space is tight in your plant? There is nothing inexpensive about a new facility. The cost of real estate (or lease costs), new equipment, people, regulatory compliance, and potential downtime add up very quickly, even for a relatively small operation. But reconfiguring your current operation has its own challenges. You have to deal with operating in a construction/renovation environment, the potential that the redesign won’t serve your needs through future growth, new equipment, and more. It’s a difficult choice. To gauge the feasibility of your current facility, you should arm yourself with as much information as possible. 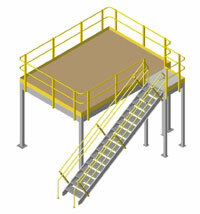 Do you have accurate layout drawings of the facility as it sits, racking, process equipment, conveyor and all else? Surprisingly, many people don’t have this, and have to create it as they move forward. You must know clear ceiling heights, column spacing, dock door locations, and other important measurements. Going lean: The application of lean or 5S principles typically help operations reduce the footprint of an operation by simplifying and straightening the “line” between functions. However, the goal of these types of programs isn’t really to create new space. Go tall: If you can improve storage density by going with taller racks, or add production space above an area with a mezzanine, it’s possible to eliminate or delay the need for a new facility while actually improving your overall efficiency. You can also take advantage of unused voids like the space over your dock doors. Starting all over: It’s not inexpensive to tear out older storage equipment and completely redo what you have, but it’s less expensive than a facility move. Overhead conveyors or high density carton flow are proven space savers that cost substantially less than a new or moved facility. Consider new concepts and layouts to free up the necessary square footage. Reducing function/inventory: Consider what inventory or functionality can be cut without damaging your critical operation. If you are picking and packing orders, and you have very slow movers, can you simply cut those? Is the loss of that inventory worth the delay or elimination of the need to move or reconfigure your operations? Outsourcing: Consider using a public warehouse or 3PL for parts of your inventory, in particular those items that can be separated or shipped to customers without creating complications. If the stock in question doesn’t need to be in your building, perhaps you can ship it from an alternative and use the space for more value added functions or inventory. Consider shift work: While storage areas may be inflexible, production or staging work could potentially be executed by a second (or third) shift in the same space. For instance, if you ship/receive during first shift, and use the staging area for assembly on second shift, that’s space that works for you twice. You may be unable to do any of these things if the end result is reduced customer service or if you will find yourself pressed for space again too quickly. You may be able to save space and increase your productivity simultaneously, and that could be the best of both worlds.